Memphis Sound will provide the fanfare for several corps who will perform as part of the Sound of Champions Drum Corps International Summer Music Games Tour event on Tuesday, July 17 in Memphis, Tenn.
As one of two events hosted in July by Memphis Sound, the corps is sure to be a hometown favorite at Liberty Bowl Memorial Stadium located in the heart of Memphis' Mid-South Fairgrounds. 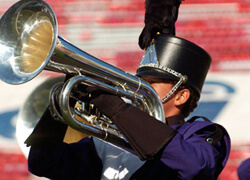 The Cadets, Pioneer, Carolina Crown, Blue Knights and the Crossmen also are scheduled to perform. Tickets for this event are now on sale ranging in price from $23 to $28. A special group rate is available to those purchasing 20 or more tickets. Purchase Sound of Champions tickets now!